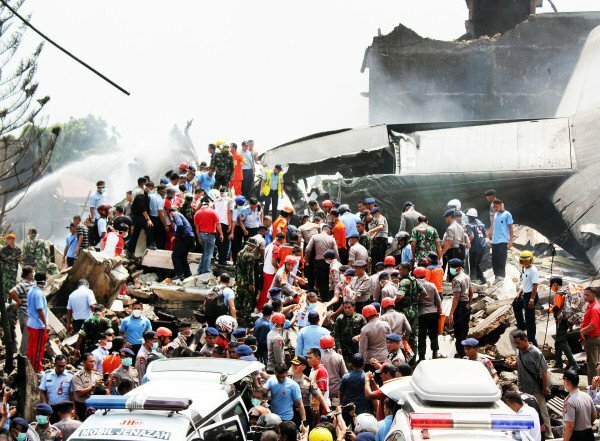 A military transport plane crashed in a residential area of the Indonesian city of Medan killing more than 100 people. Air Force head Agus Supriatna visited the crash site and told reporters he believed there were no survivors among the 113 people on board. At least 66 bodies have been recovered so far. There are reports that people are trapped inside wrecked buildings and the nearest hospital is continuing to receive bodies arriving from the crash site. Many of the passengers are thought to have been relatives of servicemen and women. Large crowds watched the emergency services search the flaming wreckage. The plane had just taken off when it ran into trouble. Agus Supriatna said that the pilot had asked to return to base because of technical difficulties. The Hercules transport plane was manufactured in 1964, but a military spokesman said he was convinced that it was in good condition. Correspondents say that it is the second time in 10 years that a plane has crashed in Medan. In September 2005, a Boeing 737 came down in a crowded residential area shortly after take-off from Medan’s Polonia airport, killing 143 people including 30 on the ground.